I could not donate one of my 12-year-old's jeans as it was ripped on the knees. Repairing it was not a question as this skinny jeans did no fit on his waist anymore. So, I came up with this bag in less than two hours! Some patterns for jeans bags are very complicated (I have one half done in a drawer, after a whole day of ripping pockets off and sewing them back in place later!). So, If you are ready to make a quick and stylish bag, look at the pictures below. Pins, good scissors, sewing machine! First, prepare the shell. 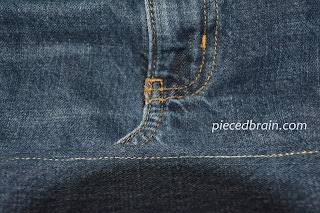 Cut jeans about one inch below back pockets. Cut the front part of one of the legs to use as bag bottom. Make sure it is the correct length so it will fit around the bottom of the bag. Turn the long sides of the bag bottom piece in 1/4" and topstitch using the yellow embroidery thread. 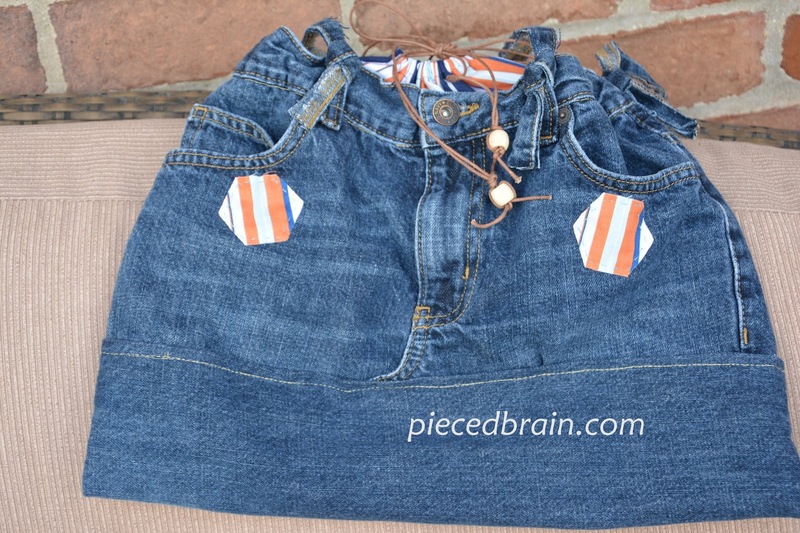 Fold this piece lengthwise with right sides together, sew the two short sides, flip it inside out and fit it over the jeans as shown above. Pin it all around and stitch it. 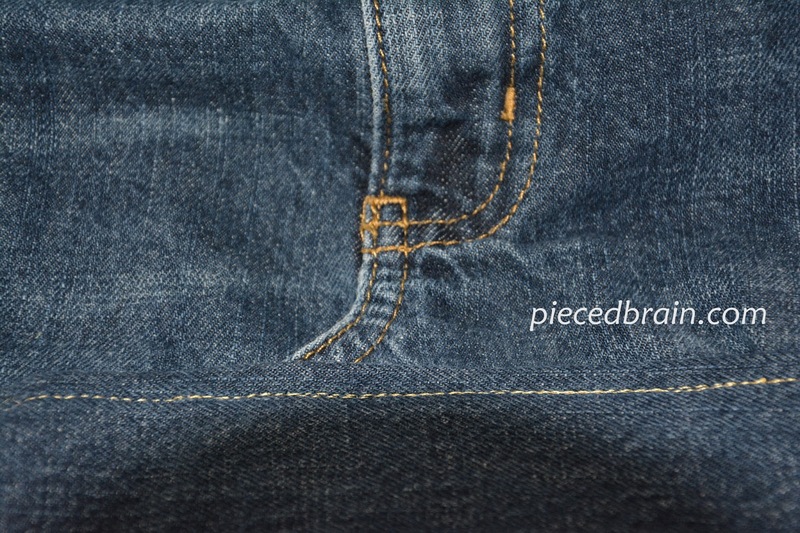 Two notes: (1) The back pockets will lose about 1/3 of their depth but you will still have good size pockets; (2) Pin front pockets lining out of the way so they don't get stitched - you will have the full depth of the front pockets for phones, keys, etc, as shown on picture below. I did turn the bag inside out after stitching the bottom on, and trimmed the jeans 1/4" away from the seam so I would not have any unnecessary bulk. As you sew the bottom on the bag, turn the bulky part right below the zipper to the left side so the front of the bag will look nice and smooth. The lining and closure for the bag are sewn as one piece. Go here for a quick explanation of how to do this, and for a fun tutorial on how to make lunch bags. Just know you will first fold the piece of fabric in half on its width, then cut about 7" from the top on both sides, sew them back in reverse (matching right side with wrong side so that the inside of lining will feature the right side of the fabric, and the outside of the lining - the part that will be the drawstring closure for the bag - will have its right side on the outside!). Then, make the casing for the drawstring by first turning in 1/4", pressing it, then turning in about 1/2". Topstitch using matching thread to your fabric. 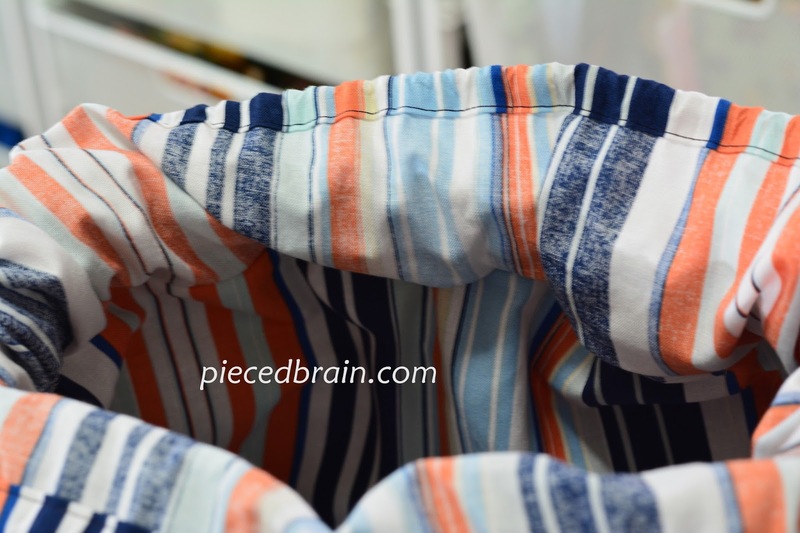 Before you sew lining to shell (right below the waist line on the pants), if the bag has one of those adjusting elastics with buttons on both sides, pull them all the way, button the elastic and cut remaining elastic piece. This will gather the waist and lend a nice look to the finished bag. If instead of tying the handles to the belt loop you prefer to sew them to the bag, insert them in between lining and shell where you want them and sew them to the bag as you are stitching the lining (provided your machine doesn't mind the bulk; if it does, make fabric handles). add the beads if you like, stitch the hexagons to the front pockets with embroidery thread, and voila'! Done in under two hours! When I showed it to my husband and boys they thought it turned out so cool (Ryan had mixed feelings about his pants being turned into a bag until I pointed out to him that it no longer fit him!!!). I hope you enjoyed this tutorial! Let me know... and happy sewing! Oh... don't forget the blog hop and giveaway, tomorrow is my day (Tuesday, August 27). It`s very cute.Love it and thanks for the tutorial! Cute bag and a great tutorial Denise - love that you added the drawstring! 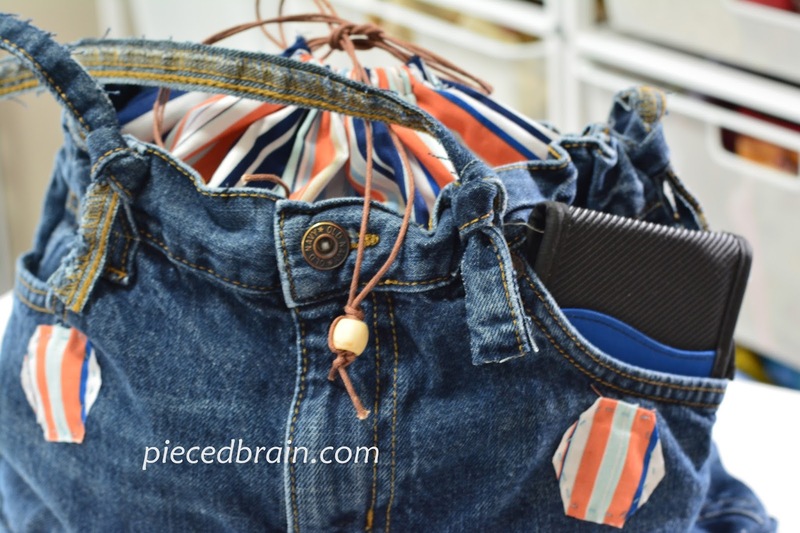 Love your denim bag! Thank you for sharing the great tutorial. How clever! I think I'll go to the thrift store for some small jeans to make my granddaughters this cool bag! Very cute. A creative idea indeed. 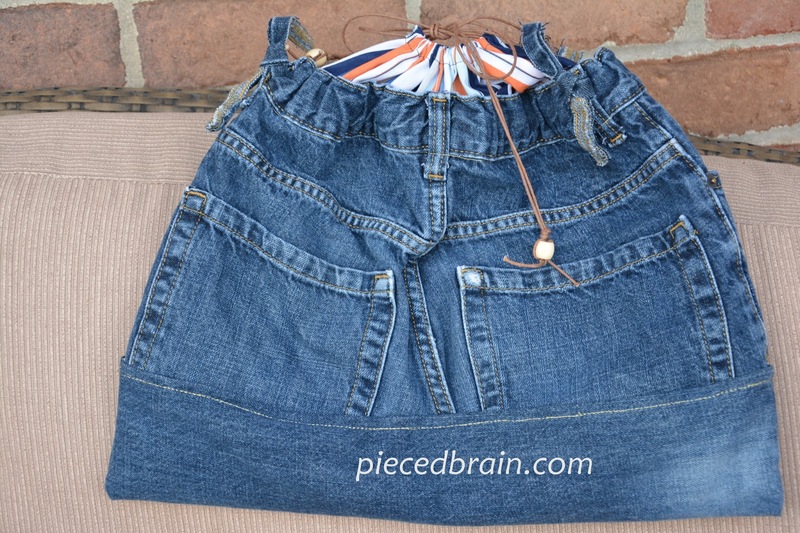 Great way to recycle those old jeans! Cute idea! nice bag thanks for the tutorial. This is so cool. I've been meaning to use my sons old jeans to make a denim bag with, so thank you for inspiring me..
What a perfect way to recycle Denise and the inside fabric is neat! Thanks for sharing. What an adorable project! I've been wanting to make this kind of a bag, and it never quite gets to the top of my list. You did a great job. Love the bag and great tutorial. Great tutorial - perfect for the beach! Awesome tutorial!. I cleaned out my scrap box and found a half a pair of jeans in there today. Guess what I am going to try! Thanks again! Thanks for the great tutorial. I am definitely going to try this! Genius! Love this so much. Thanks for taking the time to put up a tutorial for it - pinning for use later on!